In part 1 we told the story of how the Southern Heights Food Forest grew from a seed to sprout. In 2014, our sprout began to grow branches, reaching out and up. As these branches grew, our volunteers began showing their strengths as organizers and community builders. More fertile soil was added to our roots through many kind contributions from local organizations. 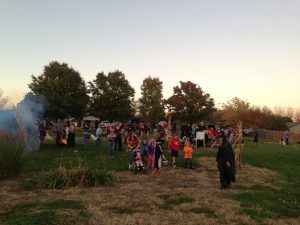 In October of 2014 we had our first Annual Trunk or Treat at Southern Heights Presbyterian featuring the food forest. This brought a lot of congregation and community members to our space. It was also a very successful and fun fundraiser! Thanks to Carol Ann Anderson and her team for organizing it! Our First Trunk or Treat! In April of 2015, our very handy congregation members Dave Barnhouse, Jim Harder and Neil Kolder built us a shed with funds generously provided by Mystic Rhodes Productions. Now we had a place to protect our tools and wheelbarrows! Also that month, we established our first pollinator garden provided by the Nebraska Environmental Trust. We had an amazing turnout and our community finally had a chance to bring the dream into reality. We sheet mulched the 400 square feet of what would later be the home of a multitude native plants and insects. At the same time we planted our first trees! Pecans! This was a big day for the Food Forest. It created stronger bonds through work and gave us the confidence to keep going! Great turnout for setting up the pollinator beds! In June of 2015 we continued with Elderberry, Chokecherries and Wild Plums! This was another day of fun in the sun! Not only were the Pecan trees growing but we also establish a whole new area of the food forest in our “Thicket Zone” with delicious berry and fruit bushes! In August of 2015, Campbell’s Nursery and our volunteers installed the pathways for the Nature Explore Outdoor Classroom. Campbell’s was very kind to charge us just for material costs which made it much more affordable to install this very large component of our vision. Now with these pathways in place, all community members can enjoy the benefits of outdoor education and creativity! Thanks very much to Heather Fox for her dedication to our outdoor classroom! I huge thank you to Rotary District 5650 for providing funding for the project! So much changed in a few months! We also came together for our first ever build party. 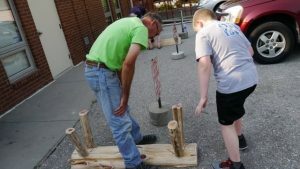 Eleven Volunteers came together to build benches, an art easel and tables for our gathering, building and nature art areas. Once these pieces where put together and put in place, the Nature Explore Outdoor Classroom became an inviting place for everyone to discover their creativity and building skills. We installed Persimmon, Paw Paw, Walnut, Hickory and Chestnut trees in November of 2015. With these trees in the ground the major components of the Food Forest where in place. Now all we needed was water, time, and mostly understory plants to complete the project! Which is what most of 2016 has been devoted to. Thanks to Bob Hendrickson of the Nebraska Statewide Arboretum for his expertise in tree selection and providing us with the backbone of our great endeavor. It’s this amazing collaboration with experts and community members that have taken a flat field and turned it into an example of diversity and cooperation! Great group of food foresters getting some trees in the ground! As the season came to a close in 2015, so much had gotten done by pure volunteer power and community support. Our sprout had become a sapling. In 2016, we found out how even more amazing we could become with paid staff! Check out Part 3 to bring you to our current awesomeness! If you’re thinking about converting your lawn into a functional member of the household (a garden), you’re probably a little overwhelmed with the prospect of changing the whole landscape with little or no experience. Rest easy, here are a few designs to get your feet wet (by watering your plants) and start the permaculture revolution in your own space. 5. Perma-tainer –. When making a mini-permaculture garden in a container, the root structure, height and width of the plants used need to be highly considered. A simple example is Broccoli, Beans, Lettuce and Carrot. You’ll want to plant the broccoli directly in the middle because this plant will take up the most root space in terms of width and depth. To help with feeding the surrounding plants, place the beans just inside of the imaginary circle your broccoli roots would grow out to. In permaculture, you place plants close together to maximize yield per square foot and to allow roots to intermingle, like in a natural ecosystem. Just inside the bean’s “sphere of influence” you’ll plant the lettuce and finally towards the edge of the container will be the carrots. Bringing the carrots to the edge of the container encourages an easier extraction of the vegetable when it’s time to harvest. A little disruption of the lettuce roots is permitted. The more you learn about the science behind polycultures, which is a grouping of plants that benefits each other, the more interesting ways you can build your perma-tainer! 4. Three Sisters – There’s a reason why Native Americans have lived on this continent for thousands of years. They know how to work with nature to benefit society. A perfect example of this is the Three Sister Guild. A guild is planting design that includes all the elements of a healthy ecosystem. The central element of the design is corn, next to the corn beans and squash can be planted. As the cornstalk grows, it creates structure for the beans to climb. As the beans grow, it fixes nitrogen into the ground to feed the squash and corn. 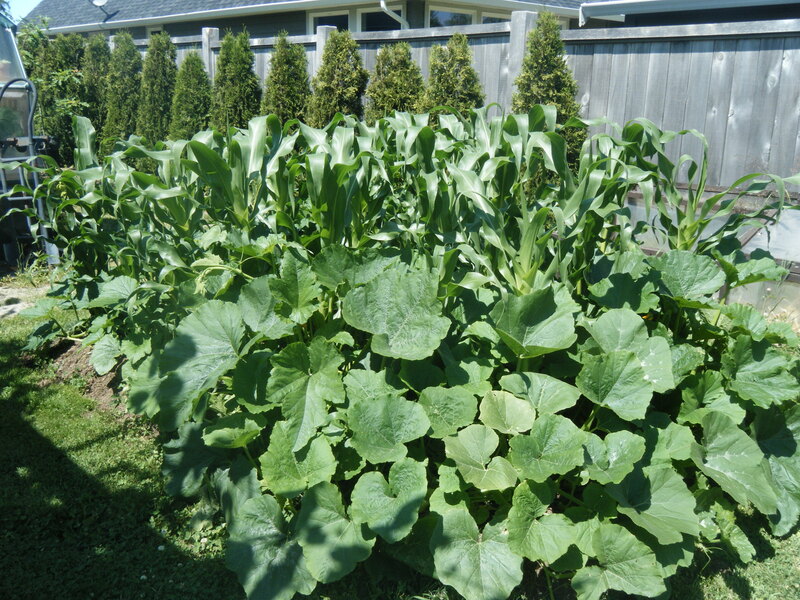 As the squash grows, it covers the ground reducing competition from “weeds” making a healthier bean and corn plant. Boom, a healthy ecosystem at its simplest! Variations can be made with the guild. For example, Sunflowers or other fast growing plants with a strong stalk in place of corn. You can also use any other legume for nitrogen fixing and broad-leaved vine plants for groundcover. 3. 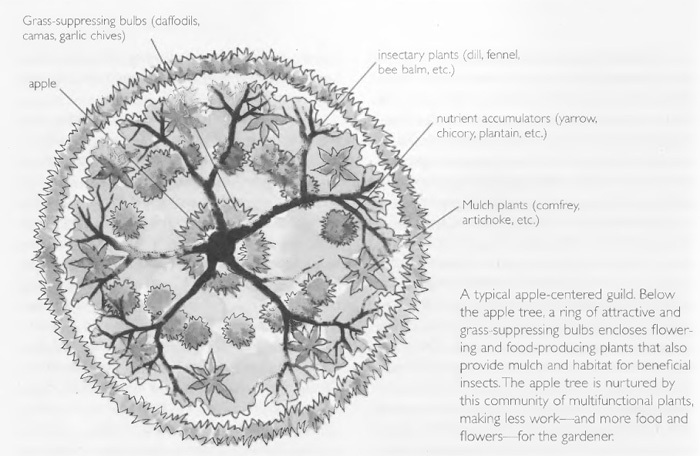 Tree Guild – Tree Guilds are great ways to understand “stacking functions” in a permaculture design. First you start with your central element, which is typically a dwarf fruit tree but any you want will do. Next you figure out where the “dripline” for the tree will be. The dripline is how wide the tree will grow when it’s mature and will be the perimeter of your design. Along the dripline, place grass suppressing bulb plants like daffodils, chives or garlic. Within the perimeter of the dripline with be the rest of your guild which includes plants that has a certain “function” either fixing nitrogen, attracting beneficial insects, accumulating nutrients, creating mulch, groundcover and/or repelling pests. The sky’s the limit on what you’d like in your guild. The “stacking functions” concept comes in when you have a plant that does multiple functions and another plant may be redundant plus another function. Having multiple nitrogen fixers is smart for new gardens and tree guilds. If the plants are feeding each other, adding compost in the future is unnecessary! 2. Key Hole Garden –Turn row agriculture on its ear and create a Key Hole Garden by bending it into a horseshoe shape. Here you a save space that would have been unproductive pathway. When you’re in the middle of one of these designs, it feels like the garden is hugging you for being so thrifty with space. Plant placement in these gardens can be either straight horse shoe shapes, staggered or both. A good tip is to plant your taller plants to the north to maximize southern exposure. To take it to the next level place multiple key hole gardens in different shapes to fit your yard. Ultimately, you’ll have more plants for maximum benefit. 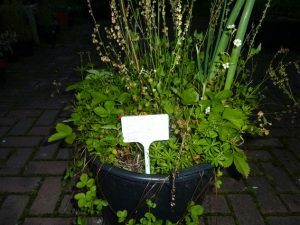 1 Herbspiral – The beauty of a herb spiral is not just in its cool shape. By creating a three-dimensional bed, you are conserving space by making a larger planting area in a small footprint. Imagine how much more surface area exists on 1,000 square-acres of mountain than on a 1,000 square-acres of flat desert. It’s this topographical fact that makes this quasi-vertical garden design so beneficial. 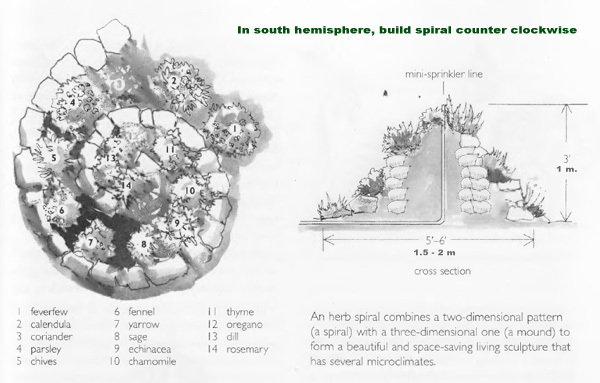 The shape of the spiral also creates micro-climates that maximize your plants viability. Because all life is influenced by the sun and its shadows, low-laying northern parts of your spiral will be cooler and wetter than the southern side of your mini-mountain. With this knowledge, you can plan plant placement. Also, species that usually don’t hang out together can create interesting arrangements in a relatively small space. Be creative with the materials you use to build the spiral. Try rocks, bricks, even logs placed vertically. 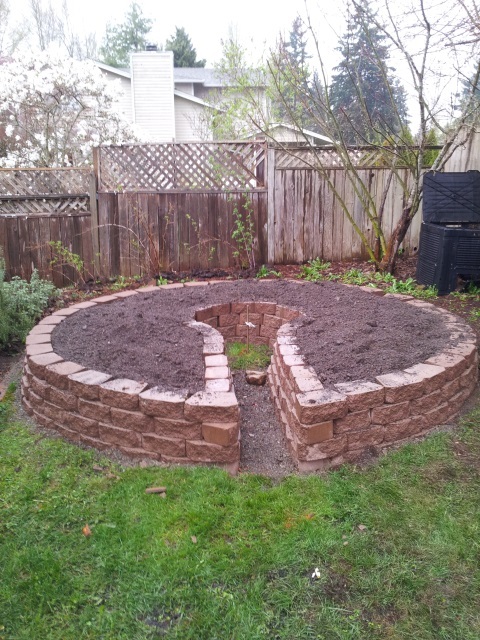 You don’t even have to plant herbs in your herb spiral! Plant pollinators, medicinals, fruits, vegetables, natives or whatever you’d like! The more inventive you are the more awe-inspiring your spiral will be. 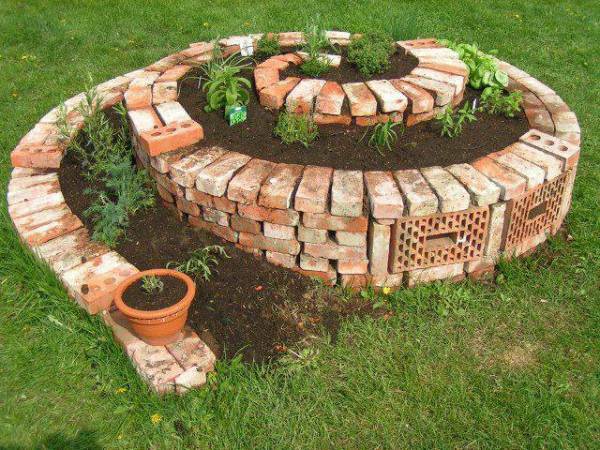 Large or small, bricks or wood herb spirals are the coolest! Well, there you go! 5 easy projects to get your permaculture gardens going. Work smart and hard! But not too hard! 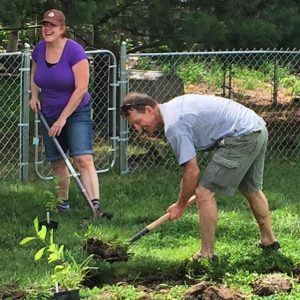 A Food Forest for the Community. It’s the weekend. You’re off work and the world is your oyster. You look out your window into your yard and see that patch of bushes you’ve been meaning to trim for months. The weather’s perfect, not too hot or cold and your body is pulling you to get some fresh air and sunshine. You grab your gloves, shears, and Bluetooth speaker and step out into your own special space, your garden, shaped by no one but you and your family. Some of my favorite days have been spent turning what my yard was when we moved in, into a place that is uniquely me. Building rain barrels, a green house, raised beds and compost bins, I loved the physicality of the work and the lack of a deadline to get it done. When I work for myself, it’s at a pace of my choosing. Now that I got the tomatoes in, I could just sit for a while with a cup of water and meditate on what I just did. Then my eye would wander to the hackberry sprouts with their single leaves flagging themselves for removal. Once my body was rested, I’d start a new album on my mp3 player and make short work of those stubborn sprouts, making my blackberry bed look like a spread in a gardening magazine. The whole day would melt through the process of “What’s next?” and “Get’r done”. I inhabited a world with no ceiling and a space all my own. Working at the Southern Heights Food Forest is very much the same. I arrive early in the morning, sip my coffee and sit, surveying the scene. Which beds should we expand today, where is the bindweed the worst, where am I needed the most? Then I put my cup down, and get to work. It’s a little different than my own space because I’m not just working for myself. I’m working for the community. When you work in this manner, there’s no time to lollygag. 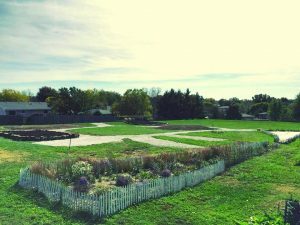 Here at Southern Heights, we want to show our neighborhood how fun and educational an outdoor classroom can be with its art area, natural building space and balance beams. We want to show our friends we can make a living growing food on a small parcel of land like partners Dustin and Jordan are doing on their Urban Agriculture Plot. We want to show each other how to care for the land by caring for the food that will feed our children through our Community CROPS community gardens. We want to show Lincoln how quickly and effective edible landscaping is. With seven substantial beds being developed in our food forest, we’re already prepared to harvest food this year! Even though I had great times in my yard, my favorite times have always been spent waking in the morning, getting supplies together and meeting my fellow volunteers at the food forest. The feeling of common purpose and meaning is what life is all about. We laugh as we work. We find our rhythm as a community. Two people moving their wheel barrows, two at the mulch pile, two others spreading it across the new bed. 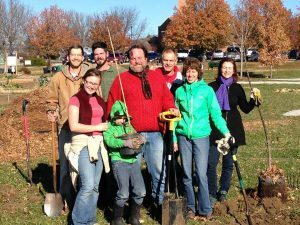 Working together as equals, in a food forest for the community. Every generation has its challenges. In the 1960′s everyone rallied around the idea that we should Feed the World. The Green Revolution brought that dream into reality as new varieties of corn came to the farm. Food production nearly tripled. As it turns out, feeding the world is harder than it sounds, but the roadblocks were created by politicians and not farmers. Do we have enough to feed the World right now? Probably. But certain countries are not interested in the food we grow, as our corn contains less protein than heirloom varieties and may also be genetically modified. So what do we do with all of this excess corn? We get creative. We turn it into ethanol and high fructose corn syrup. As we adjust to our over abundance of corn, we realize that our current farming practices are unsustainable. Our corn varieties cannot grow without the application of fertilizers and pesticides, both of which are petrochemicals. Agribusiness has consolidated farms and created humongous monocultures that require gargantuan machines to plant and harvest. Let’s assume those harvester/combines don’t get Prius MPGs. So as the fossil fuels go, so goes our entire system of modern agriculture. So what do we do? What is the major challenge of OUR generation, or more likely, the generation of our children? I believe it is our job to create the blueprint for a resilient society, one that can sustain itself in perpetuity. How do we do that? Where do we look for inspiration? We look to nature. These species and ecosystems have been sustaining themselves for millennia, and if we learn and apply their secrets, we can do the same. Enter the Southern Heights Food Forest (SHFF). 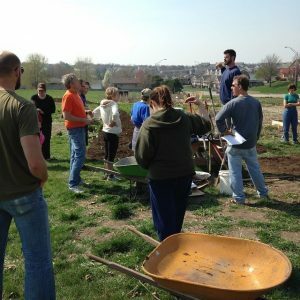 Lincoln’s food forest won’t feed all of those in need in Lincoln, not even if it was twice the size. That’s not the point. Our intention is something deeper, more organic, and we might not see the fruits of our labor for a generation. In order create a more sustainable society, we have to change our core beliefs and modify our everyday behaviors. We expect the SHFF to serve as an inspiration to everyone that visits, especially our children. The SHFF will show us that nature can collaborate, that plants can grow larger and more efficiently if grown side-by-side with different species. The SHFF will show us that we don’t need to rely on the Frankenstein crops of our grandparents to sustain ourselves. If we want to be on this planet in 10,000 years, it won’t be by our current behaviors of dominating nature, it will be by the behaviors of future generations that find inspiration in nature. Our experiment won’t be perfect. The food forest alone will not solve our problems. But by building and embracing the SHFF we are signaling to our children that “We’re ready!” We’re ready to find a new path to sustainability. We’re ready to change our behaviors and embrace a new mode of thinking that will carry us far into the future. We are ready to tackle the great challenge of a our generation. By building the SHFF, we take one giant step forward in that direction. In the not too distant future, Lincoln will be the home of an advanced technology that only exists in a few places around the world. Instead of a large, sterile, polluting space complete with massive production facilities, this place will be regenerative, vibrant and welcoming. This facility is the Southern Heights Food Forest and the technology it will develop is time travel. I can sense your grin as I write this. But hear me out: The Southern Heights Food Forest will give you glimpses of our indigenous past, our transitioning present, and our sustainable future. Let’s begin with the past. Although the Beacon Food Forest in Seattle, Washington is known by many as the first food forest in the nation, the first true food forests were the organically-occurring forests themselves. Historically, our species and our decedents have browsed the woodlands since the beginning and this tradition continues today in uncolonized cultures, and with cavalier foodies looking to introduce new colors to the pallet of their diet. At Southern Heights, our community can re-sync with this sacred human tradition as we browse to see if its gooseberries for lunch or if the acorns are ready to gather and process. Next, the Southern Heights Food Forest time machine will bring us to our present society in transition. For all of the devices we’ve created, we feel less and less connected to the human community and non-human world. The promises given by a single-serve disposable lifestyle are ringing hollow. We’re yearning for something authentic and undeniably ours. The Southern Heights Food Forest will be a place for us to unplug from our devices and reconnect to the real world. A ride on the bike, trip on the bus or stroll down the street will give us access to a place surrounded by those who are creating an inclusive diverse community. The forest will be the place we will build our skills to create the future our children deserve. And now we travel into the future. Our neighborhoods look familiar yet strikingly different. Garages have turned into greenhouses. There are more bikes than cars parked near houses. Folks are sitting with loved ones on porches. 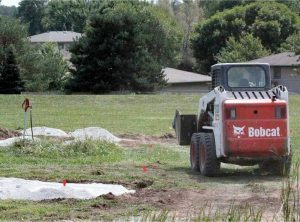 Chemically-treated lawns have been replaced by native plants. The rain doesn’t just wash down into the gutter; it is harvested and reused. It feels safer here because we take care of each other and the land that takes care of us. Somehow, we have remembered what it means to be a living community. That process of remembering began at the Southern Heights Food Forest. For me, the food forest is more than just a garden. It’s a place to honor our past, understand the present and work for my children’s existence. Most of what must happen to transition us successfully into the next century will be modeled at Southern Heights. Right now, it may seem like a modest plot of land. I promise, if we work together, it will be historic. My family and I moved to Lincoln just under a year ago as I received the call to serve Southern Heights Presbyterian Church (SHPC) at the corner of 40th and Old Cheney Road. 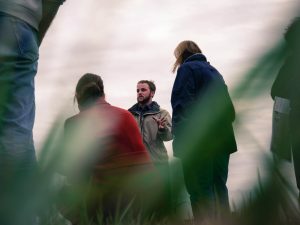 When I arrived, I was excited to learn about this innovative collaboration between SHPC, Community CROPS and Nature Explore as the three organizations joined together to create something new and exciting for the community. In a future post, I will share why I, personally, feel called to this work…but today, I feel that it is important for me to stress that it’s not just me, but the community of SHPC that believes this. We believe that we are called by God to care for the great creation that God has given us. And, as a result, we are active and proactive in our conservation efforts. We work to reduce our consumption, waste and energy usage. We use post consumer recycled products where we can, and where we can’t, we make sure that what we do use is recyclable or biodegradable. We invest in sustainable growing efforts around the globe, and we support and endorse the “Fair Trade” industry. As people of faith, we believe that we are called to live out those callings (and more) in all that we do: in our worship, in our work and in our play, in our thoughts, our words, and our deeds. And so, when we were given the chance to engage these two callings (care of creation and care of people through food) in one project it seemed the perfect opportunity to live out what we feel called to. Engaging in and supporting the work of Food Forest is one way that we strive to do so. At Community CROPS, we talk about helping families grow healthy food and live sustainably as our mission, and implementing this takes many forms. Community gardens, farmer training programs, classes and youth garden education are all parts of the solution but Community CROPS is always looking for innovative ways to grow the local food movement through education and new local food sources. 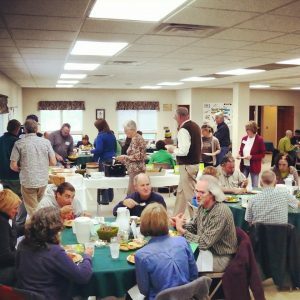 The Southern Heights Food Forest is an exciting new venture from Community CROPS, Nature Explore and Southern Heights Presbyterian Church, which will be a showcase for Lincoln and a model for additional food growing projects. 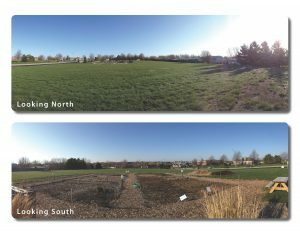 Southern Heights already has a community garden on their property at 40th and Old Cheney Road, and the Food Forest project will add more garden plots, larger spaces for growing food for market, an outdoor classroom and a food forest. The food forest part is the most exciting new project from my perspective, as it will provide a longer season and more diverse palette of local foods for our community. It will mimic a forest design with multiple layers of plants from root crops to vines to trees. Plants are healthier and easier to maintain in this diverse environment, as they provide multiple benefits to each other. Some plants will provide food for bees, butterflies and birds. Other plants will improve the soil and suppress weeds. The food forest will also be a healthy and beneficial environment for humans. Imagine wandering through the food forest sampling serviceberries, fresh picked sorrel or Good King Henry (both tasty perennial greens). Later in the season, you will be able to pick juicy peaches, pawpaws and apples right off the trees. While you’re at the Food Forest, you’ll also be able to learn about how you can grow these same plants in your yard, what care they need and where you can procure them. We want the food forest to be an inspiration for everyone to expand their definition of “edible foods,” and to share with each other. I look forward to the development of the entire food forest project as the permanent food growing area will be a delicious addition to our community and an inspiration for edible landscaping across Lincoln. It’s all part of taking back our food supply and connecting with each other for meaningful change. Two years ago, I had just finished my undergraduate degree in Landscape Architecture at the University of Wisconsin-Madison and I found myself packing my parents’ minivan to relocate to Lincoln, Nebraska for a job with Nature Explore. I wasn’t quite sure what was in store for me, but I did know that the thought of moving to Nebraska alone was terrifying. My only previous experiences with the entire state were driving through on I-80 en route to Colorado, and a very vague family reunion during my childhood that included catching piglets on a scavenger hunt of a farm. I couldn’t help but think that I was making a huge mistake, especially considering I was leaving behind one of my favorite cities, an amazing group of friends, and proximity to my family. The transition was not an easy one at first. All of the sudden, I was in a new city, with no friends, and no sense of place. It was definitely culture shock coming from a city that I knew so well and felt like I knew everyone. Luckily, some co-workers pitied me enough to invite me to a few social events and, in time, I began to establish a close group of friends. Finally, after a few months of sulking and pouting, I decided that I needed to give this a real shot. After getting some experience traveling and working on a variety of different projects, I began to develop more of an awareness that this was my opportunity to recreate myself – to explore interests that I never had a chance to before, and to take some chances and try new things. I began attending more community events and reaching out to new people. 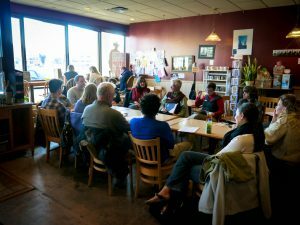 It wasn’t long before I realized that Lincoln has a uniquely strong sense of community that is hard to find in other places. Through various connections and existing friendships, I met Amy Rose Brt, the Program Director for Community CROPS. After a few conversations and meetings, we knew that we could combine forces… somehow. Personally, I wanted to work with Community CROPS to figure out how we could make community gardens more active public spaces. Amy liked this idea, but her heart was set on building a “food forest.” My reaction: “That sounds amazing… but what is a food forest?” After a quick explanation and a few more conversations, we started drawing and the rest is history. What started as a lofty idea developed into a full-blown, community-powered project. Before we knew it, we had established a steering committee, a concept plan, and had begun spreading the word. 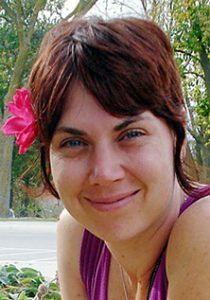 But as the project began to develop, Amy’s health continued to decline. When we first met, I knew she was battling cancer, but she never talked about it and didn’t want anyone to treat her any differently. Most of the time people never knew she was sick – her energy, enthusiasm and dedication to the changing the world was what shined through in all of our interactions. As her battle grew and the disease progressed, it became harder to ignore. Our conversations began to happen more by email and telephone. Our meetings began to take place in her living room. It became difficult for her to leave the house at all. On May 26, 2013 I received a message that Amy had passed away. As commonly felt with death, my mind raced through wide range of emotion. Sadness for everyone’s loss and especially for her beautiful seven-year old daughter, Anya. Happiness, because she was no longer in physical pain and confined to the walls of her house when we all knew she yearned to be outdoors. Anger that I didn’t get more time with her here in this life. And then there was a strange feeling of joy, because I realized how fortunate I was to have a chance, even if it was brief, to be impacted by Amy. There was a magic to Amy that radiated throughout every room she entered. Her love for life was contagious. She found a way to find beauty in every situation, no matter how messy it was. She embraced her imperfections and celebrated her uniqueness. She was authentic and was not afraid to tell you what she thought. She was an activist who was committed to changing the world and who didn’t take no for an answer. She was real. This project means so much more to me than I can put into words. The Southern Heights Food Forest has made me feel part of this community. It has given me the opportunity to really explore my passion, not only as a professional, but as a community member and human being. It’s given me the opportunity to meet some of the most sincere and genuine people I have ever met – people who have encouraged me, embraced me, and empowered me. But more than anything, it has connected me to something much bigger than I could have ever imagined. 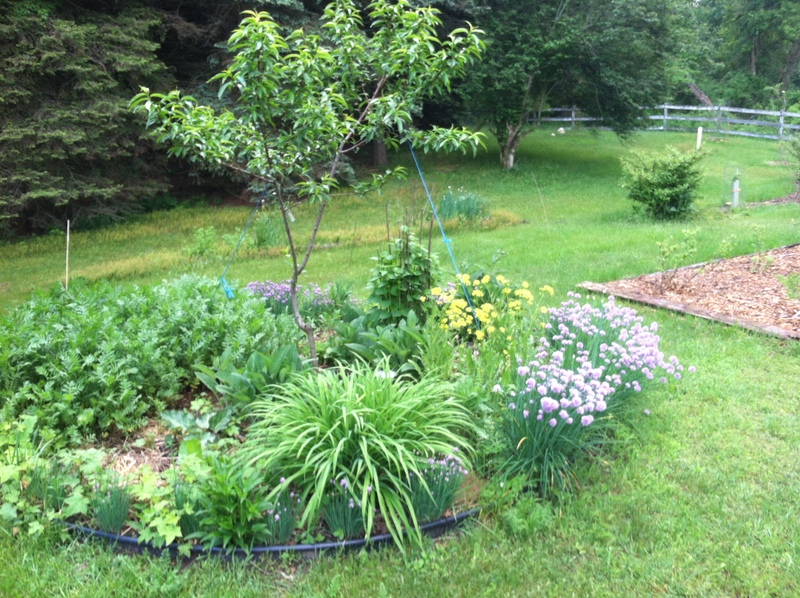 To me, the Food Forest is a representation of life. Each year it will become more beautiful, passing through seasons, upturns and setbacks, all the while becoming stronger and more resilient. It will teach us something new every day. It will bring us together and celebrate our diversity. It will be a living, breathing catalyst that brings people together, to better understand each other and our relationship with the earth. Like any collaborative project, the Southern Heights Food Forest has many stories behind it. Through time I wanted to make sure that we celebrate everyone’s – how we got here, what it means to us, and what we hope to see. Because of her instrumental role in the creation of this project, I felt that it was most appropriate to begin by sharing the story of how this project began with Amy. Sometimes I have trouble telling this story, because I don’t want to ever give the impression that I am trying to tug on people’s emotional heartstrings. There are people involved in this project that knew Amy much better than I. But I want to make sure people have a chance to appreciate how influential and inspiring she was to everyone, and I know we all want her legacy to be remembered. This project is only a small portion of the good that she shared with the world.